“Beech Tree Quintet”, 2018. 56”(wide) x 64”(high) x 8” (deep). Welded wire, polyester fabric, ink and light. “Winter Tessellation”, 2018. 32”( wide) x 50” (high) x 4”(deep) . Welded wire, polyester fabric, ink and light. ''Fall Tessellation'', 2018. 66''(high) x 51''(wide) x 4''(deep). Welded wire, polyester fabric and ink. photo: Ian Meissner. ''Fall Tessellation'', detail. photo: Ian Meissner. ''Summer Tesselations'' 2018. 3 x (36'' x 54'' x 3 1/2'') Welded wire, polyester fabric, thread, black and silver ink. Summer Tessellation #1 36'' x 54'' x 3 1/2''. CCFO Okanagan, travelling textile workshop preparation. Suspended 7' x 7' grid made of welded wire and polyester fabric. Fabric burning on polyester fabric. Tools for a Modern World, 2017. Folding installation. 13' x 4' x 6''. Recycled welded wire, recycled polyester fabric, thread, magnets and black ink. ''Best Foot Forward'', 2017. 4' x 8' (each). Welded wire and fabric. ''Best Foot Forward'', part 1. 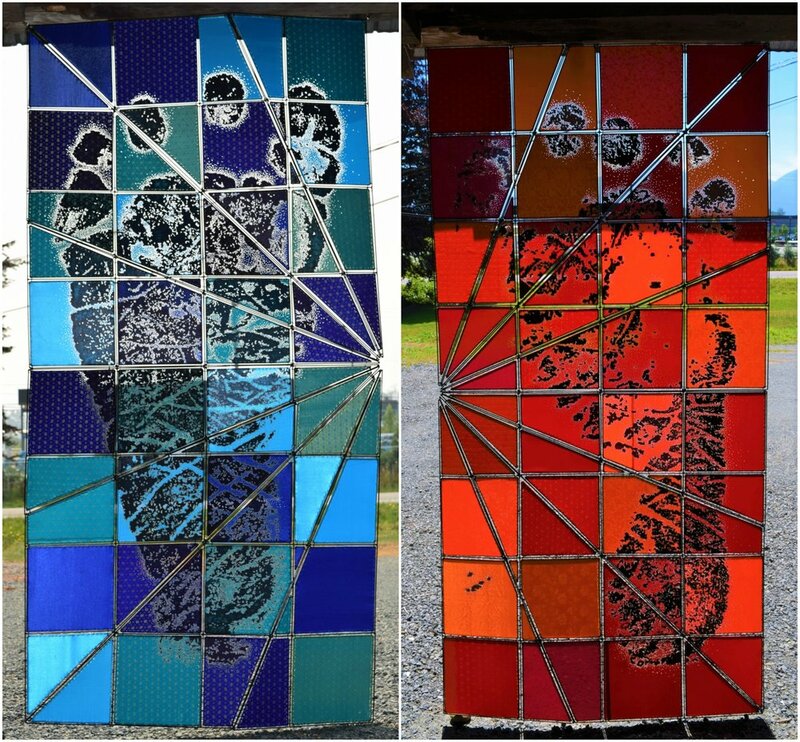 42''x 85'' suspended fabric and welded wire piece made from a 2000% enlargement of an infant foot print. Voici la 1ère partie de cette installation suspendue inspirée d'une empreinte de pied d'enfant. Here are preliminary plans and fabric samples. The completed first part of the piece was inspired from the foot print on the right. The next one will be from another infant's foot print (left) Interesting how I can see the personality in the prints already. The next one will be in green and blues. Voici des croquis préliminaires. La personalité des tout petits se devide déjà. J'ai agrandi l'empreintes de droite de 2000%. Le travaille commence pour celle de droite. ''Archipelago'', a folding piece, made for travelling. 92'' (W) x 56 (H) x 24''(D). Here, I used personal photos, boat and house shapes as metaphors for family. Maybe we are islands and life is a voyage of discovery. This piece folds up an can go on a trip of its own. ''Archipels'' est une oeuvre sur le thème de la famille. Elle se plie pour mieux voyager. Peut-être sommes-nous des îles et la vie, un voyage de découverte. Vidéo: Radio-Canada, Colombie Britannique/Yukon Monia Blanchet, émission ''Clin d'Oeil'', 2016. Concerned about global warming, Hot and Bothered is a series of woven banners made of recycled snow fence material. This April 2016, we have experience unprecedented early hot weather. Part of western Canada is already in wild fire alert. With this new work, I am looking at the effect of the low snowpack on wildlife. “Salmon” and “Bear” are the first two of a larger series that shows the interdependence of species and the precarious state of their environment. “ Whale” refers to the the North-Atlantic right whale, one of the most endangered of all large whales. As in earlier works, I am re-using materials in an attempt to reduce the carbon footprint of my art practice. 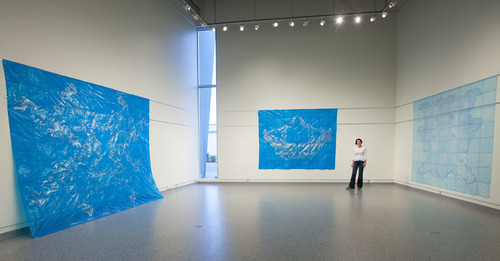 In “Hot Spot” (2014) and “Vanishing Ice” (2015), I used recycled steel wire, fabric and waste plastic to make large translucent suspended installations. In this new project, the snow fence is associated with themes related to territory, development conflict and environmental issues. I am non-aboriginal artist living in B.C. for the last thirty five years. Amongst many things, first nation’s art, design and more importantly, craftsmanship from all over the world has of been part of my formative years in sculpture. The way cedar can bent into boxes, roots woven in intricate baskets and bits of bone find their way functional and ritual objects, inspire me. In life and in art there is integration of process and intent. I believe that creativity is part of the solution to our awkward relationship with the planet. Concerné par le réchauffement climatique, Trop chaud la faune est une série de bannières tissées faites avec des clôtures à neige. En avril 2016, le mercure a atteint un record de chaleur. Une partie de l’ouest canadien est menacé par les incendies de forêts. Avec cette nouvelle œuvre, je souligne la menace que représente pour la faune la faible quantité de neige. L’ours et le Saumon furent les deux premières pièces d’une série montrant l’interdépendance des espèces et la précarité de leur environnement face au changement climatique. Ensuite apparu la baleine, représentant la baleine franche de l’atlantique nord. C’est une des espèces les plus menacées des grandes baleines. Comme pour mon travail précédant, je récupère et recycle des matériaux pour réduirel’impact de ma pratique artistique. Pour Hot Spot(2014) et Glaces en fuite(2015), j’utilisai du fil de fer récupéré ainsi que des rebus de tissu et de pellicule de plastique pour créer de grandes œuvres translucides suspendues. Pour ce nouveau projet, j’associe la clôture à neige aux thèmes des conflits de territoire, développement et environnement. Je suis une artiste non-autochtone vivant en Colombie-Britannique depuis trente-cinq ans, influencée par le design, l’artet l’artisanat des premiers peuples d’ici et du monde entier. Le cèdre qui plie dans la confection des boîtes des nations côtières, les paniers de fines racines tissées et les inclusions de fragment d’os d’animaux me fascinent toujours. En art comme dans la vie, l’intention et le processus s’intègrent. Je crois que l’acte de créer peut aider à quérir notre difficile relation avec la planète. My studio is in the attic of a small 1920 farm house in Chilliwack. Every day this winter, I had a visitor. A northern flicker (type of woodpecker) tapped endlessly on the cedar shakes, just by my work table. Was he drilling for food or performing some kind of mating ritual? Was he sending me a relentless SOS message, alarmed by the dramatic change in his environment? In the last few months, the fields across the street have morphed into a large industrial park. Events like this are often the catalyst for new art. My diverse sculptural art practice is inspired by themes related to history and the environment. I make large sculptural installations for windows and developed my own technique on textile that I combine with welded wire work. “How Deep Is Your Lake” and “Hot Spot” are two installations where I have shown the beauty and fragility of our aquatic environment and the effects of climate change. “Turf Wars”, a series on endangered wildlife species, was shown several times since 2011. “Flicker” is made of plastic, welded wire, thread and permanent marker. Departing from my use of fabric, I used 95% recycled materials and drew on salvaged plastic. With enlarged mirror images of a northern flicker, I created a totem-like form. My roots are in Quebec but, for the last thirty five years, I have been influenced by the symmetry of the Pacific Northwest First Nation’s design. I am fascinated by their powerful use of animals as nesting design elements. There is a pecking order (pun intended) amongst these animals. Who is dominating who? Who is upside-down or sideways? I have used symmetry extensively with images and text. Using mirror-images, I can juxtapose opposing ideas and languages. I also use scale playfully, sometimes making animals larger than humans. I want to draw in the viewer in the hope that my art poses questions about the world we live in. Can you hear Flicker’s SOS? A few years ago, I travelled by train and bicycle from the Fraser Valley to the Rocky Mountains. It was the occasion to mark a milestone birthday and travel backwards, half way to an earlier starting point in life. I was drawn back to the Columbia Icefield like metal filings to a magnet. It was the same spectacle that left me in awe many years ago, speechless in front of the icy majesty. There was exhilaration for hours. The walk from the road to the ice was much longer than I remembered. The tourist buses had multiplied and there were large signs forbidding visitors to walk on the ice. The glacier was receding. Never again would we be allowed to walk on the icefield. In the following year, I reflected on that day and the sense of loss that I felt. I had been interested in environment issues. Since 2011, I had made three sculptural installations: “Turf Wars” was about endangered wildlife species. In “How Deep Is Your Lake”, I presented the aquatic environment as beautiful but fragile, playing with fabric and bathymetric maps. With “Hot Spot”, I looked at the Canadian north, using mirror images of topographical maps and words in English and Inuktitut. If it takes an emotional trigger to commit to months of work on a new project, I think that it was found that summer. I was getting older, nature was changing too fast and there was no time to waste. I embarked on a journey with new materials and techniques fuelled by a desire to find solutions for the dilemma facing sculptors: storage, exhibiting context, and shipping of artworks. Never again was I going to see cost, distance, volume and weight as obstacles for showing my work far away. I had to find a way without giving up on sculpture. I decided to put aside my use of steel. No need for rigid skeletons to support my translucent sculptural pieces. They were going to be loose, light, foldable and, most importantly, inexpensive to produce. I am not new to recycling. For decades, I have been scrounging for reusable material and even gave a second life to my own finished works. I also put aside textiles and experimented with salvaged plastic. Eventually, series of large plastic quilts were born. I drew maps of four iconic glaciers of the world. After the Columbia Icefield came Mont Blanc, then Patagonia and the South Pole. I used mirror images of enlarged photocopies of all the glaciers, cut them in 11’’ squares and traced them on thin plastic squares of the same size. On dark blue plastic I drew with silver ink. A dark blue marker was used later on the light blue material. Finally, the squares were sewn together like quilts. I now have four large translucent drawings that can hang on walls. From a distance, the organic forms look like gigantic Rorschach inkblot tests. I love the fact that I can make natural features such as glaciers look like probes into our collective unconscious. Could there be a psychoanalyst explanation for our modern anxiety facing environmental change? «Glaces en fuite » est une réflexion sur le réchauffement climatique. Il s’agit de grands dessins translucides réalisés sur du plastique recyclé à partir d’images en miroir de cartes topographiques. Il y a quelques années, j’ai voyagé en train et en bicyclette depuis la Vallée du Fraser jusqu’aux Montagnes Rocheuses. En atteignant ces montagnes, j’ai pris conscience d’un retour à un point de départ dans ma vie. Un peu comme un aimant agit sur la limaille de fer, j’ai été attirée par le champ de glace Columbia. Ce paysage majestueux imposait le respect et même une certaine crainte, tout comme il l’avait fait il y a fort longtemps. Je ressentis une joie de vivre qui dura des heures. Mais le front de glace me parut beaucoup plus loin qu’autrefois. Aux touristes descendant des autobus, des affiches grand format défendent de marcher sur la glace. Le glacier recule. Jamais plus on ne pourra y mettre les pieds. L’année suivante, je songeais à cette journée et ressentis un certain sentiment de deuil qui a certainement orienté ma démarche artistique dans mon intérêt pour l’environnement menacé. En effet depuis 2011 à aujourd’hui, j’ai réalisé trois installations. D’abord « Turf Wars» qui traite des espèces animales menacées. Puis en utilisant tissus et cartes marines, j’ai créé « How Deep Is Your Lake», une représentation de la fragilité de l’environnement aquatique.. Enfin «Hot Spot» est un regard sur le nord canadien par l’utilisation de cartes topographiques en miroir sur lesquelles s’inscrivent des expressions en anglais et en Inuktitut. I was invited to work with the graduating students of Ms. Miller's class to do a legacy project. I proposed to use fabric and bicycle wheel rims as materials. There was to be integration of the curriculum, with a focus on social issues. The students work in six teams and chose subjects that they felt passionate about. Animal rights, child slavery, discrimination and the environment were some of the themes expored during the project. The student made a design for each wheel, found images to be photocopied on acetate and did some "fabric burning". They were a very engaged and skilled group that made me feel welcome and excited to get back to community-based art projects. Hot Spot explores the impact of climate change in the Canadian North, and how this, in turn, affects all Canadians and our global village as a whole. The work is a melding of burnt fabric, acetate maps, text and other visual elements touching on Canadian geographic politics and the politics of language. How Deep is Your Lake? Exhibited in six locations from 2012 to 2014. Welded wire, polyester fabric,photocopy on acetate, silver ink..
How Deep Is Your Lake is a series of suspended sculptural pieces for windows inspired by the beauty and fragility of our aquatic environment. My sculptural installation art practice is concerned by History and the environment. For this project, I am looking at a total of six lakes in British Colombia. I have completed : Harrison Lake, Chilliwack Lake, Cultus Lake, Okanagan Lake , Murtle Lake and Stuart Lake. As in Turf Wars,the preceding installation, I am making new compositions by juxtaposing forms and their mirrors images. I use enlarged bathymetric maps (depth) that are photocopied on acetate and sewn on polyester fabric. My goal is to create large images that are abstract when seen from a distance but full of detailed graphic geographic references seen closely. I am choosing specific lakes for two reasons: shapes that create the interesting mirror image compositions and coverage of the B.C territory. As a hinged composition, there are endless configurations. Welded Wire, polyester fabric, photocopy on acetate. Installation at the Great Blue Heron Reserve in Chilliwack, B.C. Turf Wars is a sculptural installation project for windows on the theme of wildlife conservation in western Canada. Although infinitely adaptable to a variety of spaces, it is designed for the first site: inside the 16 windows of the Great Hall at the Reach Gallery Museum in Abbotsford. There are several other sites planed for the installation in the future, the second one being the interpretive centre at the Great Blue Heron Nature Reserve in Chilliwack. 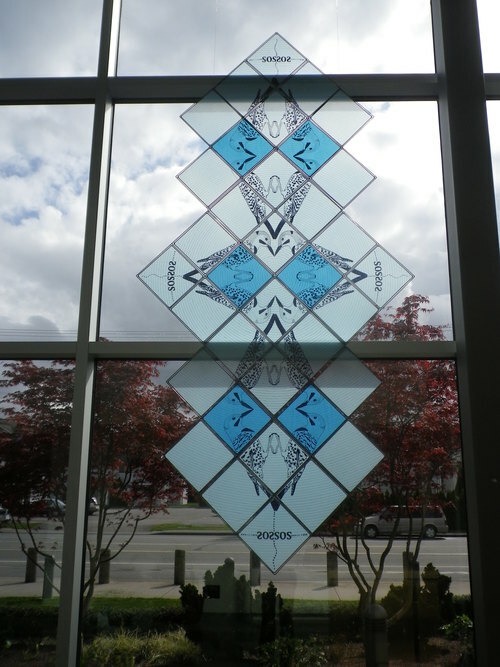 The installation consists of 105 10”x10” translucent fabric panels, to be hung on the windows with suction cups, directly on the glass, inside the gallery. This installation brings a unique viewing situation as it is visible inside and outside a building. During the day, natural light shines through all the black and red panels. At night, the windows act as architectural-size screens when the installation is viewed from outside. The inside lights shine through, making the whole building glow. Each one of the light-weight panel is made of polyester fabric, stretched and hand-sewn on a welded wire frame. The window panels will be arranged in diamond-shape formations, on 16 window panes of the north and west facing windows at the Reach Gallery. The designs pictured on the panels form geometrical compositions, using mirror images of each other from the top row of windows to the bottom row. Turf Wars will adapt to any window installation situation in future sites, with changes in the number, angle and combination of panels. The panels depict seven animal species at risk in B.C and western Canada. Inside each animal’s body is an image symbolizing the environmental threat for that particular species. You can see the following images: an oil rig inside a caribou, a construction crane inside a Great Blue heron, an oil sand excavator inside a duck, a military helicopter inside a Jay bird, a logging barge inside a Pacific Salmon, a logging truck inside a Spotted Owl and agricultural chemicals inside a Giant Pacific Salamander. By reversing the scale of the animal in relation to its environmental threat, I catch the viewer’s attention. What would happen if wildlife grew to gigantic proportions and feed on the industrial machines that destroy them in our modern world? With a bit of irony, Turf Wars shows how uneven the territorial battle between Man and the natural world is. As for the rest of my light sculptures, I will use some unique textile techniques developed over the years: fabric burning and sewn photocopies on acetate. Fabric burning is done with a soldering iron on synthetic fabric. I melt hundreds of small holes to obtain complex images. It is a very labour intensive process that gives the look of lace. I feel committed to craftsmanship in all my creative projects and draw on a lot of craft traditions, reinterpreting and combining techniques with modern materials. All the steel wire used in the fabrication of the panel frames is recycled. I use acetate and thermo adhesive lining to layer fabric and translucent photocopied images. For Turf Wars, the choice of colours is deliberate: red to symbolize the urgent nature of the subject, red and black as a reference to the strong west coast aboriginal influence on my work, both for the design tradition and for the focus on nature as a primary concern. Steel buckets, pennies, fabric, thread, light. “There’s A Hole In My Bucket” is a sculptural installation project that deals with climate change and its effect on agriculture in Western Canada. Southern BC was hit by a severe drought this summer. Fires destroyed homes and forests. Even the green Fraser Valley, where I live, turned brown. This also had a direct effect on agriculture. All the western provinces have suffered in the last few years. Combined with mad cow disease it adds to the strain on agriculture. I have been looking at the environmental and political aspect of water in my work for some years. Here, I am also a bit cynical about Canadian foreign aid; a drop in the bucket indeed. Paper, mosquito screen, plastic and styrofoam waste, light. After spending fifteen years exploring different ways to express myself through sculpture, I went back to my favorite form - sculptural installation. In a spirit of renewal, I have created in the last four years, pieces that reflect my exploration of themes related to History and Environment. I use lightweight and translucent materials like fabric, paper and plastic that I often blend with lighting effects. “Acipenser Transmontanus” is the latin name for the white sturgeon. “Skwòwech” is the name in Halq’eméylem, the language of the Stò:lo of the Fraser Valley where I live. The Fraser River is a sensitive ecological area where man and nature live together. In its waters, the white sturgeon is king, a perfect example of nature resisting pollution`s attacks. As a true living fossil, the sturgeon teaches us that, with just a little help from residents of the shoreline, some species can survive. For this sculpture, I chose non-biodegradable materials such as styrofoam and plastic garbage. Who will win the race? The sturgeon or your Big Mac wrapper? Umbrellas, photocopy on acetate, light. This is an amphibian installation of 22 pairs of umbrellas representing the now disappeared Sumas Lake in the Fraser Valley. This tidal lake, covering an area of 22 sq. miles, was once a very important bird site for bird migration. There were a lot of sturgeons, an andangered specie. The Sto:lo First Nations would set up shelters on stilts for fishing and drying their catch. The lake was drained early in the 1900's at a time when wetlands were not valued and farm land was in demand. I was inspired by the tradition of memorial lanterns in the Japanese culture. For this project, I received a grant from the Canada Council for the Arts. The installation was presented on water in Manning Park and in Fraser valley ponds. It was shown indoors at the Chilliwack museum and outdoors ( on land at various events in the Lower Mainland. 10' x 10' x 44"
Welded wire, polyester fabric, photocopy on acetate, glass blocks, light. his installation was presented indoors in a solo show, "Mirrors and Fireflies" in Chilliwack and set up outside in various sites. Welded wire,fabric,bicycle parts, photocopy on acetate, light. This installation was set up outdoors in the Fraser Valley, Cultus lake, Manning Park and Vancouver island. It was also shown indoors at the Richmond art gallery. It represents four generations of women in my family. Each cardinal point or wind is associated to a generation and plant, native of the place of birth. Tools for a Modern World 2017, a folding installation. 13' x 4' x 6''. Recycled welded wire, recycled polyester clothing, thread, black ink.